The King County Superior Court ruled in favor of the Benchview neighborhood. Result: now the developer can only have two houses – not three houses – on these two lots. King County Superior Court Judge Spearman ruled that the City was “clearly erroneous” in applying one of the City’s rules in the lot boundary adjustment (LBA). (See p. 11 of Benchview Decision.) Judge Spearman reversed the City’s decision to approve one of the lots in the LBA because it is too small to be legal. The result is clear to us. This means that the set of boundary lines as approved bv the City in the LBA is nullified. Therefore the LBA is nullified. We trust the City, the Seattle Department of Planning and Development, and the developer will do the right thing and comply with the Judge’s decision. The developer can submit a new LBA application, but now he cannot claim to have three buildable lots because of the house currently under construction. His first LBA claimed that he had three lots, two of which were legal because of the “historic small lot loophole.” But the house currently under construction sits on both of those small lots, disqualifying them for the loophole and combining them into one lot. This leaves him with a total of two lots. We see no law that binds the City to come to any other conclusion. By having two houses on two lots, the developer will follow the same rules as the rest of us: one home per lot. The developers are Dan Duffus and his partners, including JMS Homes, Inc.
See the City’s law which states that a house which straddles two small lots combines them into one standard lot. Exhibit B, below, from the City’s website of laws shows that the house on lots C and D ties those lots together so they can’t use the “historic lot” loophole. 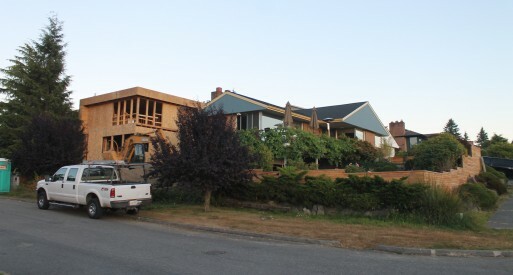 Duffus’ house under construction on lots 8 and 9 is the same situation. This entry was posted in Uncategorized on July 25, 2013 by kindneighbor.